Luxury living on a twelve acre natural park. Who wouldn’t want to live here? Built by reputable developer Townline and situated at The Gardens Richmond master planned community, a unique village neighbourhood awaits at Calla at The Gardens. Located just steps away from shopping, dining, recreation and a short drive to downtown Richmond, Vancouver or south of the border, these new residences at The Gardens features a rare opportunity to own in a quality concrete mid-rise building with air conditioning and sweeping, unobstructed views of the neighbouring 12 acre natural park, the North Shore mountains and beyond. Don’t miss this perfect opportunity to purchase at The Gardens Richmond. You can find out more about Calla by Townline on their corporate website at www.townline.ca. Or you can simply register on this page for more updates and to contact an agent that will help you with your new home purchase. The Sales Centre and Display Home are opening Spring 2016 at 140 – 10880 No. 5 Road, Richmond, BC. After launching the community more than 5 years ago, Townline is now happy to announce the final chapter in this sought after neighbourhood. The Gardens by Townline introduces Calla Richmond condos which follows the successful launches of Azalea and Magnolia. The highly anticipated project presents a rare and exciting opportunity to become part of this growing community that is centrally located and very vibrant. Once complete, The Gardens will be a self-contained urban village with tree-lined streets, shops and services, including Loblaws City Market. 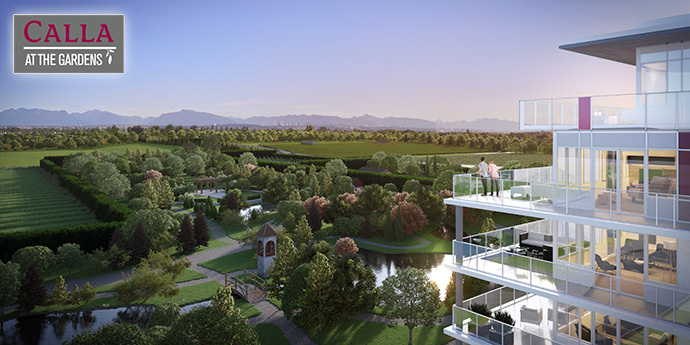 Some of the great highlights of the Townline Calla at The Gardens condos includes oversized outdoor living spaces that overlook an expansive 12 acre natural park and green space in addition to views of parks and the North Shore Mountains. The South Richmond neighbourhood is convenient and close to major transit routes and highway access, the rest or Richmond, YVR, the US border as well as walking distance to City Market, Ironwood Plaza and Copper Smith Plaza. You’ll also be a short drive away from Richmond City Centre, Lansdowne, Steveston and the new outlet mall at YVR. 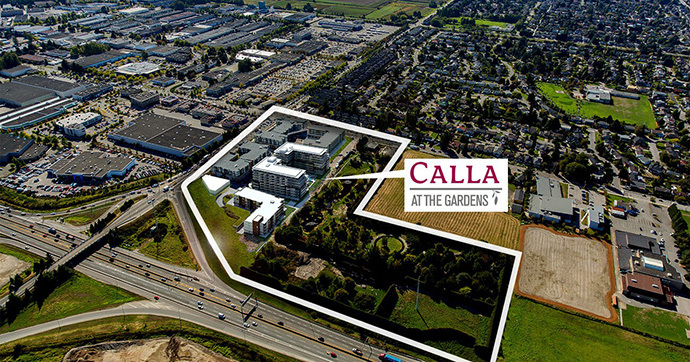 Residents at Calla Richmond condos will also be in close proximity to a variety of retail stores, services and public amenities in the neighbourhood. Calla defines a balanced lifestyle — experience natural tranquility and urban convenience right at home. Situated adjacent to the breathtaking twelve-acre park means residents get the luxury of waking up to unobstructed panoramic views of lush greenery and the scenic North Shore Mountains. Just a step away from a plethora of coffee shops, restaurants, grocery stores and entertainment facilities, Calla defines a balanced lifestyle – experience natural tranquility and urban convenience right at home. Along with the abundance of natural beauty, Calla is perfectly situated in a unique master-planned urban village known as The Gardens. This self-contained community features walkable tree-lined streets, a robust community garden, and a bounty of quality shops and services, including a Loblaws City Market located just steps from your door. Calla offers luxurious indoor and outdoor living with air conditioning, spacious balconies and sweeping picturesque views overlooking the park. The project will feature both 1 and 2 bedroom, generously sized floor plans. The quality concrete mid-rise tower of 8 stories will overlook an expansive park and will feature over height ceilings as well as air conditioning. The building and homes are architecturally designed to maximize your views and to allow more natural light into your living spaces. Luxury finishes, concrete construction and thoughtful layouts plus oversized outdoor living spaces are features of the new Richmond Calla condos. The balconies were designed to be an extension of the home, allowing you to thoroughly experience the breathtaking panoramic mountain and park views. Enjoy the stunning natural scenery from your expansive outdoor living space – sip on your morning coffee as the sun rises, barbecue with friends, take in warm sunsets, or gaze at the stars over a glass of wine in the evening. With artfully designed interiors, over-height ceilings, and tons of natural light, Calla at the Gardens is as inviting on the inside as it is on the outside. Life at Calla includes access to The Gardens Club, a 6,000-square-foot amenity complex with an indoor gymnasium for sports enthusiasts, a fitness centre with state-of-the-art equipment, and a conference room for meetings and social events. Clearly, Townline saved the best for last with Richmond’s Calla at The Gardens.